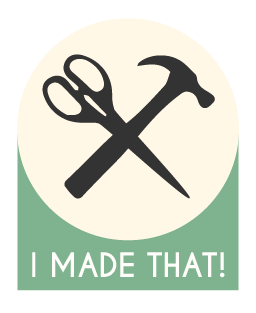 January 2017 – I Made That! Stackable — my crates needed to stack on top of each other for convenient storage and be relatively stable when stacked. 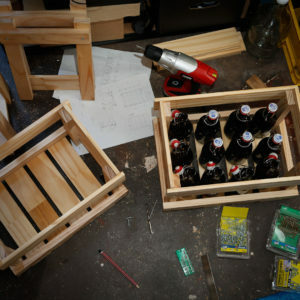 Sturdy — my crates needed to be hard wearing and last a lot longer than my beer. 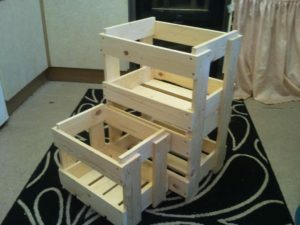 Simple — my crates needed to be easy enough for me to build and use minimal materials: to reduce costs and tare weight. Smart — my crates needed to fit my bottles. With this in mind I began the lengthy design phase. I quickly checked what the internet had on offer as far as guides and instructables had to go, but could not find anything that fit the bill. I did find this photo however, and based my drawings from the design of these made by Dan B.
I took my time measuring bottles, drawing my plans, labelling dimensions and checking my maths. I really did not want to be making these up as I went. After getting my initial idea down, I spent a bit of time on the Bunnings website checking out my timber options. I find it best to design something after working out which timber is the cheapest and best fit, and work that timber into the design from the beginning. 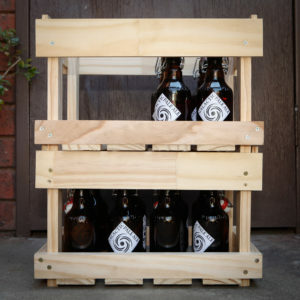 I currently have two different size bottles—330ml and 750ml—so I wanted to make a small and large size crate for each. With a bit of number crunching, I was able to design the crates so that two large crates equal the height of three small crates, which I was pretty happy with. With my design sorted, a trip to Bunnings for supplies, and a handy borrowing of Zara’s Dad’s drop saw, I set to work on the prototype/first crate. As I had spent so long getting my design spot on I made sure my cut lengths were as accurate as possible, and when I began assembly I was pleased to find that everything was very precise and square. I did however have to adjust for one design oversight and made one other slight change on the fly, but other than that everything went to plan nicely. In the end I am very happy with how they all fit together. Knitting never worked for me, I could never quite get the hang of it. 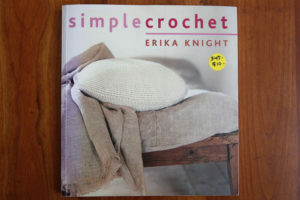 As my hands tried to manage the two needles and the wool I’d fumble my way through the steps producing a mess of knots. Sometime in the middle of last year I decided to try my hand at crochet. A youtube clip played at half speed and a few hours later, I was crocheting granny squares like a pro. Beyond granny squares, I’ve made a scarf for Simon, a cushion cover for my bestie, a wine bottle holder and am currently working on a blanket. With all of these projects, I’ve managed to find wool at Op Shops. My most recent crochet project was making a box, using shop twine (from Bunnings, hopefully I’ll stumble across some at an oppy). 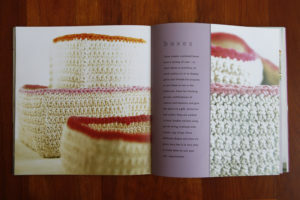 I took the pattern from a book I found at a second hand book store entitled Simple Crochet, by Erica Knight (I expect I will make a few things from this book). I decided to start with the smallest size box and half way through realised I had interpreted the pattern wrong! Luckily, after some basic maths-ing I figured out how I could adapt the pattern to the sizes I made. Apart from this hiccup, making the box sides and bottom was pretty straightforward. The twine was a bit harder to work with than wool, but I got the hang of it reasonably easily. When I came to sewing the box together I found that the sizes were all a bit different, this is probably due to the tension of my stitches or simply miscounting! I found I had to undo one row of stitching on a shorter side (known as ‘frogging’ in crocheting circles) to make sure it all matched up . After I stitched together all of the sides and the bottom, I found that it didn’t quite hold its shape with the sides being floppy! The pattern called to use strips of fabric around the top of the basket (see left) so I added this using some fabric left from many moons ago. This addition added a little more stability, but I decided to carefully pull through some fine gauge wire Simon had on hand through the fabric strips I’d just crocheted on to see if that would do the trick. 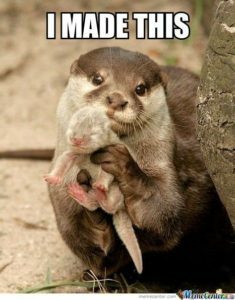 Thankfully, it paid off! The incorporation of the wire helped immensely, adding more rigidity that I expected. The box lives on our coffee table and has become the home for our remotes. Looking ahead, I would like to make two much larger boxes for Simon and I to use for storage under our bedside tables. I will probably need to consider using a twine that is more rigid, as my wire trick probably won’t work for a box that size, but I’ll deal with that when I get to it! When I first moved to Melbourne I remember shopping in Brunswick feeling like a criminal walking out of the supermarket carrying my loot in plastic bags. 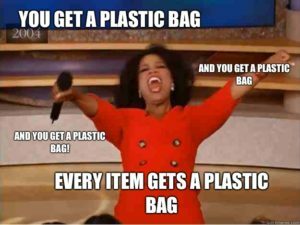 Looking back, I was the only one judging myself at the checkout, but that feeling of knowing that I was contributing to the plastic problem has stuck with me. Since then, I have done pretty well at remembering bags and refusing to put tomatoes/potatoes/etc in a plastic bag (much to the cashiers frustrations, I am sure). Even if we ‘ban the bag‘, the majority of food items come packaged in plastic anyway! 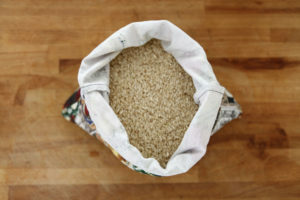 We use Fregie sacks for fruit and veg and moving forward we’d like to purchase as many of our pantry staples (rice, legumes, nuts and seeds) in bulk to reduce our plastic wastage further. 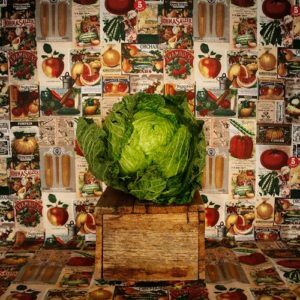 There are a few great bulk food stores a short drive away (Source & Ceres), as well as a food co-op at Brunswick Uniting Church which we plan to check out in a few weeks time. 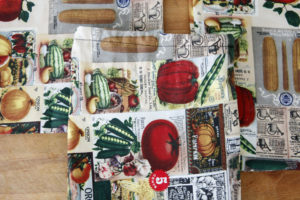 To supplement the Fregie sacks we already have, I decided to make some fabric bags to add to the rotation. I found a metre of so length of cotton drill in my fabric stash (which I used in a styling photoshoot I did a few years earlier featuring a cabbage as a model) and got sewing. In total, I made nine bags of varying sizes, used some cotton string we had on hand for the drawstring and all in all am happy with the results (apart from the pattern ending up sideways on a few!). They should be hard wearing and have already proved handy on a trip to stock up on a few staples. Next step is to find a way to note the item codes on the bags to assist the check out person! The pattern may be sideways, but I used every bit of fabric. Spoils from our trip to the bulk food store. Some Saturday mid-way through the second half of last year I found myself in the Salvos in Collingwood. I’ll often have a quick look through the coats on the odd chance of actually finding something nice that also fits me (it seems most male op-shop donators are 5′ tall and 3′ wide), and this day was one of my luckier ones. 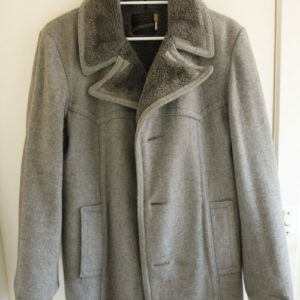 I spotted a nice grey mid-length coat—just what I was looking for. I tried it on and it seemed to fit nicely! But then I noticed it was actually not all that clean, to the point of it being a little bit gross. I was ready to give it a pass, but Zara confirmed it looked quite good on me and that it should come up nicely after a little dry-cleaning. Plus it was only $15.25. So I bought it. After getting it home I tried it on again, and that’s when I noticed that the lining in the sleeves was completely gone. As in, it wasn’t there at all. I’m not sure what the previous owner had done with it or why, but the only theory I could come up with was that their arms were too buff to fit into the sleeves, so they removed the lining to make space. 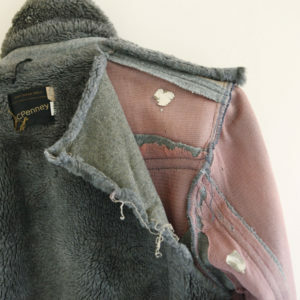 I do not suffer from this affliction and was quite sad that my new coat was so damaged. Zara helpfully pointed out that it wouldn’t be overly difficult to repair and, as luck would have it, we already had some material that would be suitable. So I set about getting Zara to show me how to measure up the sleeves and cut out the pattern. Quite a few months then passed, then we decided to start this whole making/mending thing and my coat seemed like the perfect project for me to tackle first. I pulled it out and realised I don’t really know anything about tailoring. Luckily I have Zara, who was kind enough to work out how to open up the lining, sew the new sleeve lining on to the original, and then put it all back together again. 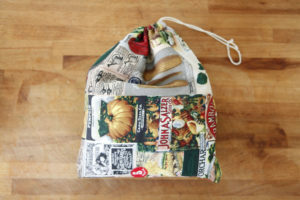 I attempted to do as much as I was able, however I hadn’t used a sewing-machine since probably 2001, so Zara did do some of the trickier bits. As simple as I thought it was going to be, it took a considerable amount of brain power for me to keep track of where everything was supposed to be and which way out to sew things. My hand stitching certainly is nothing pretty, but I feel very satisfied with the finished product. To be able to wear something that could very easily been just another piece of landfill is very satisfying, and I feel that I possibly value my clothes that little bit more, which is surely a good thing. 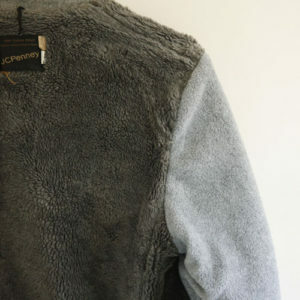 All in all, I can say making relatively simple repairs to high-value clothing is certainly worth it. If you lack the skills yourself, you might be surprised how easy it is to find someone in your friend/family circles who can help, or there a plenty of tailors around who still do repairs and alterations. Definitely worth trying.